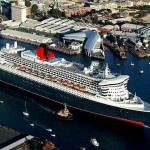 Queen Mary Cruises NET is an unofficial fan website dedicated to the Cunard Queen Mary 2 cruise ship – the most famous ocean liner and one of the top 3 largest vessels listed in the Southampton cruise ship schedule each year. 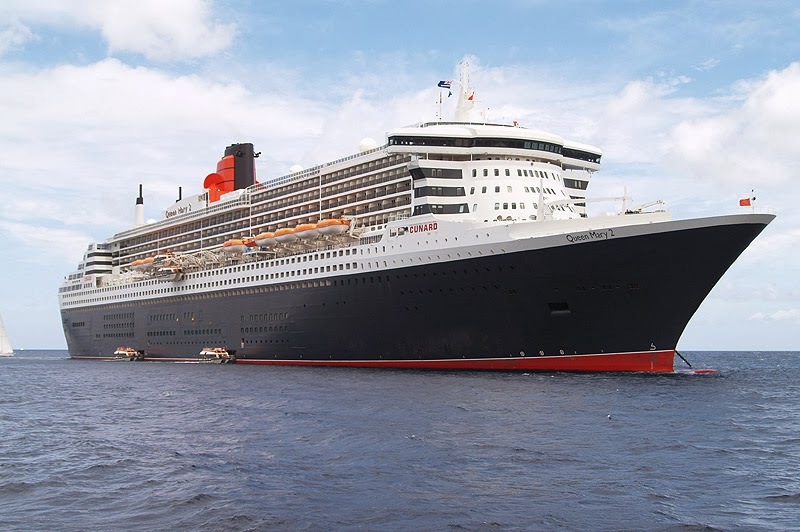 Our QM2 cruise ship review here is integrated with the QM2 deck plans (all accommodations and facilities location by deck) and with RMS Queen Mary 2 (ship details, construction and fun facts). 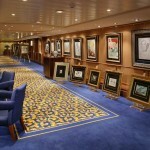 All the photos below are courtesy of Cunard Line. 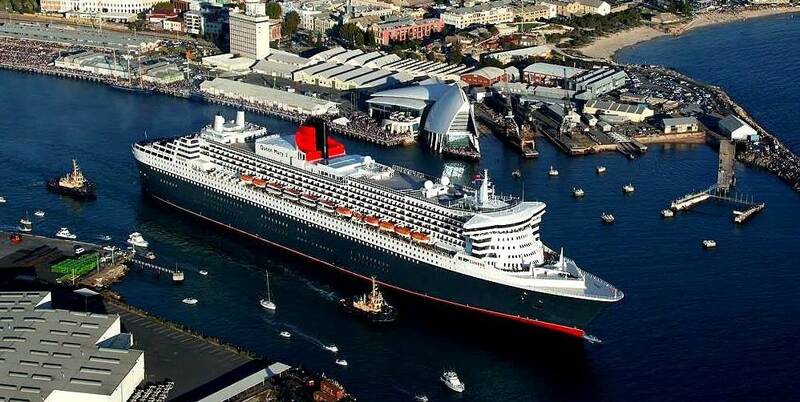 Cunard 150,000-ton cruise ship Queen Mary 2 (“QM2” as known affectionately) took cruise industry by storm at her launch back in 2004. And this magnificent cruising lady still turns heads. She’s gracious and old-world fashioned, but considered the only true ocean liner since the Cunard Queen Elizabeth 2 ship debut in 1969. 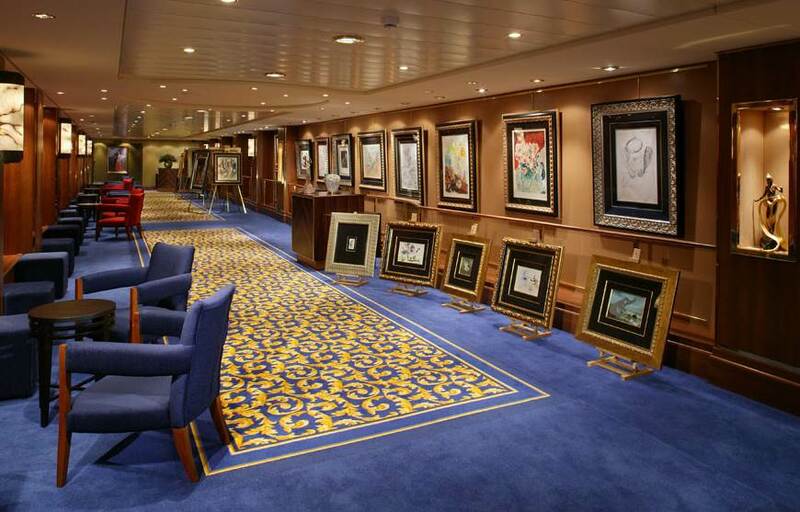 QM2 antiques and artwork reflect this legacy. 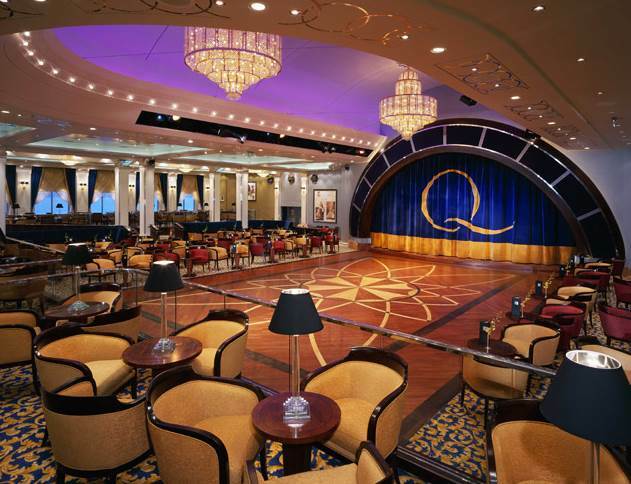 Read here all about the QM2 cruise ship onboard experience – the basics (including information on dress code and gratuities), the facilities (passenger staterooms, the Spa & Fitness complex, all dining and entertainment options. 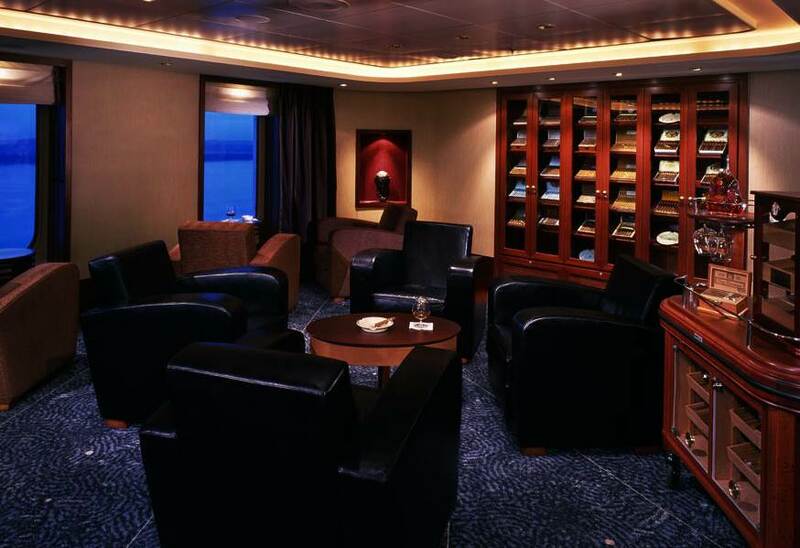 The cabins include two groups – Queens and Princess Grill class staterooms, top of them being the enormous Grand Duplex Suites, with private dining room, lounge and deck space, comprising 159 ft2 (15 m2) insides on up to 248 ft2 (23 m2) deluxe balcony rooms. 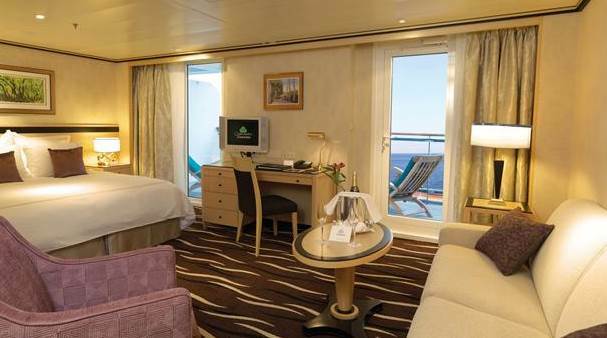 QM2 also offers cabins that can accommodate third or fourth passenger, though they are too small. 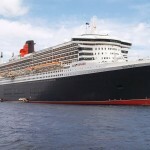 Queen Mary 2 operates as two-class cruise ship – Grill and Britannia Class. 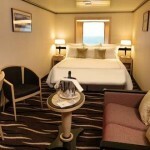 It provides 10 cabins categories, and 25 price grades. 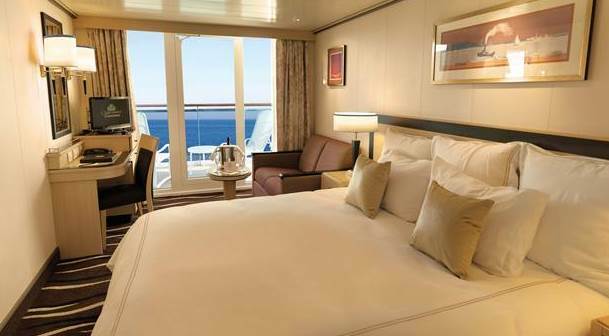 The choice offered is unrivalled onboard any other vessel – from outside-view standard cabins to the most lavish suites afloat. All grades feature 20-inch (or larger) TVs, digital video (with movies in English, German and French) and audio on demand. 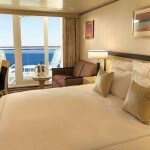 Two combinations onboard QM2 offer equivalent of large at-sea-house. 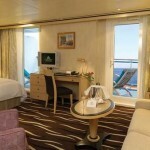 Combine Queen Mary and Queen Elizabeth suites with Queen Victoria and Queen Anne suites to produce huge living space. 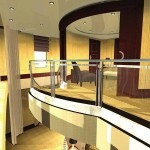 After joining Grand Duplex apartments this one would be enormous. 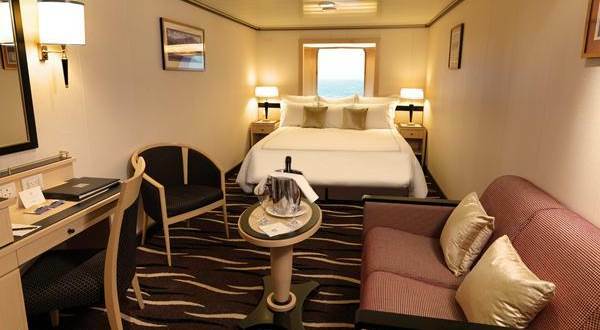 More affordable are the 782 premium/deluxe balcony cabins, the 62 outside-view or no view (interior) cabins, and the 12 atrium cabins. 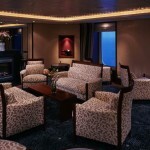 Thirty cabins and suites in various categories are designed specially for wheelchair users. 36 cabins are designated to accommodate hearing-impaired or deaf passengers. Q5 – Q6 – Suite – 506 sq.ft. (47 m2). 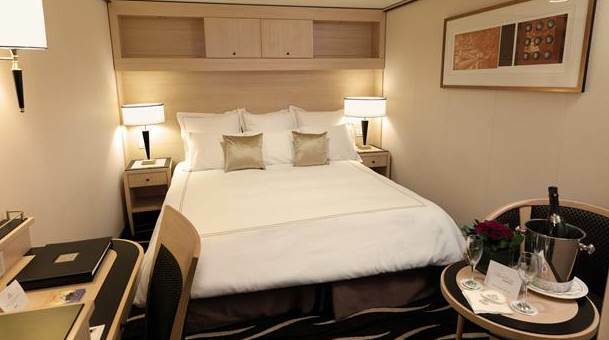 Located on Deck 10, QM2 Princess Grill accommodations are spacious Junior Suites (381 sq.ft / 35 m2) with large balconies, bath with shower and tub, sitting area, walk-in closet, interactive TV, a concierge and a cabin steward ensuring flawless service. 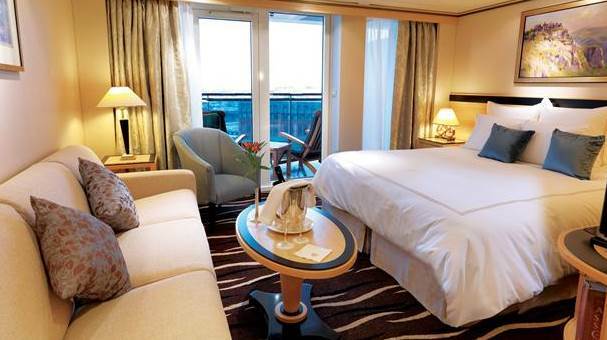 Guests in QM2 Junior Suites are offered single-seating Princess Grill elegant dining. 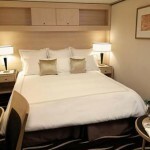 QM2 Standard staterooms look more like the deluxe guestrooms on ordinary ships. 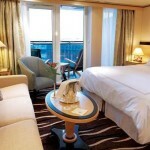 They are spacious and beautifully decorated – feature fine wall prints, sofas in soft colors, turndown service. 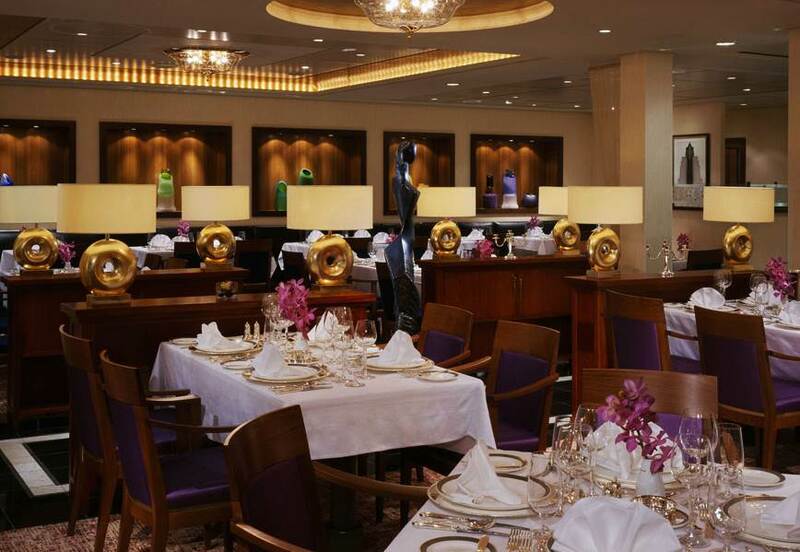 Guests have reserved tables in Britannia Restaurant, but they can also choose one of the alternative dining options. 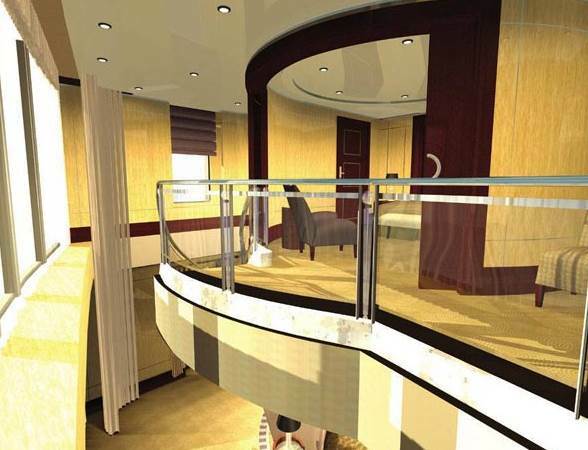 D2 – D6 – Inside Staterooms – 194 sq.ft. (18 m2). 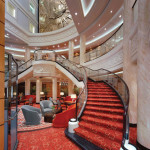 Naturally, QM2 passengers should expect luxury dining, and the ten dining rooms and eateries truly provide it. 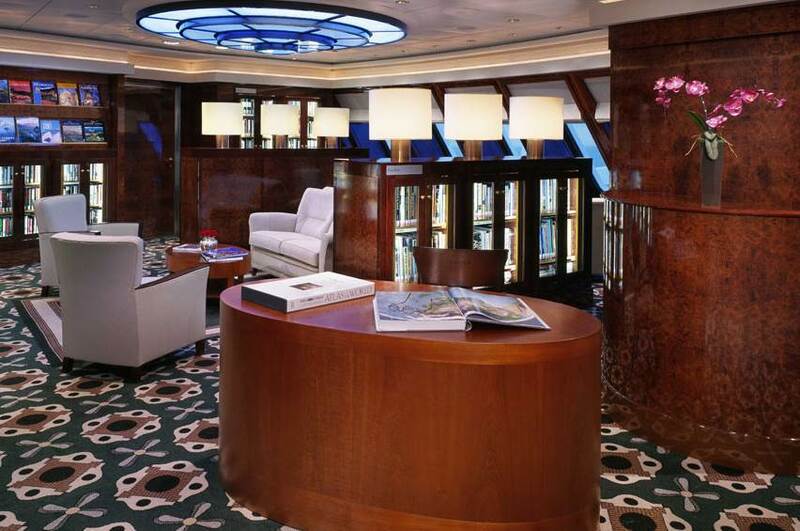 As with ocean liners’ custom in the past, each of the staterooms is matched with a table reserved at QM2 sea-view restaurant, by the largest afloat wine selection. 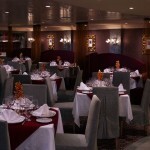 Of course, guests can always make reservations and choose one of the optional dining alternatives. Another extra is the 24 hours a day room service. 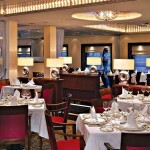 Britannia Restaurant is the main dining room with 1,347 seats. 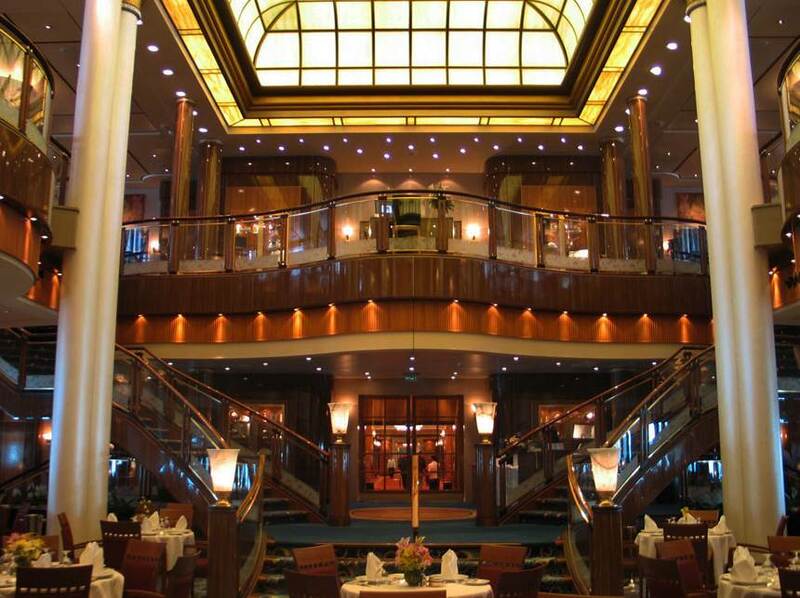 It’s height is almost three decks, and it has two grand staircases. 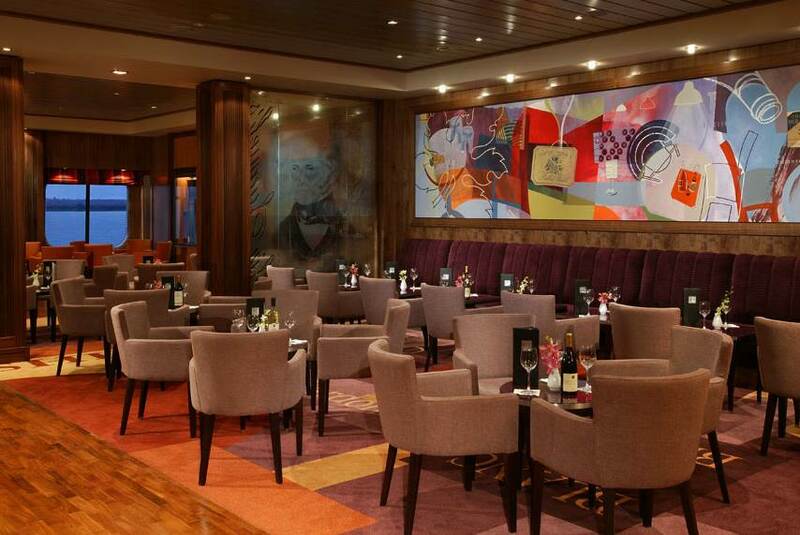 The 178-seat Princess Grill and 200-seat Queens Grill are smaller dining salons. 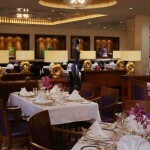 Queens Grill dining experience is excellent, it includes free caviar together with the other luxury dishes. 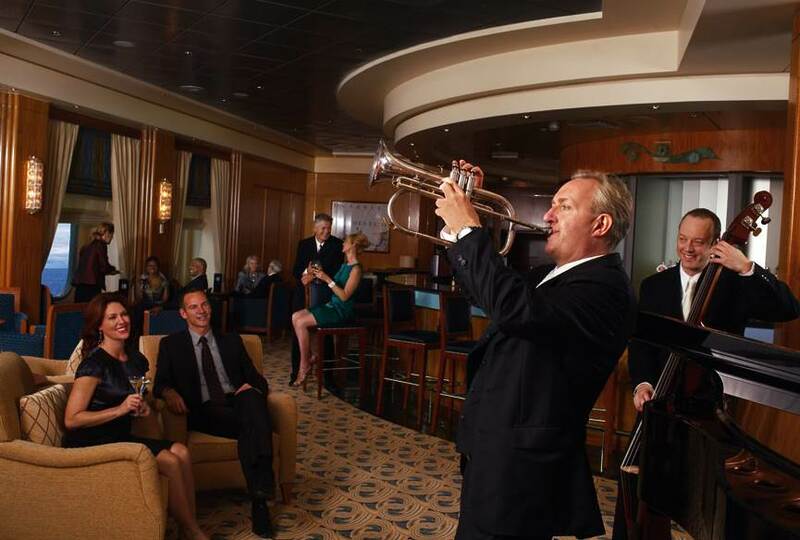 QM2 continues Cunard tradition of dining rooms specially for those in higher class suites. 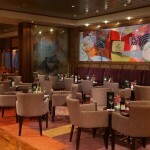 Guests in one of QM2 Q categories are free to savor the delicious specialties of Queens Grill. Princess Grill is only reserved for passengers in P category. 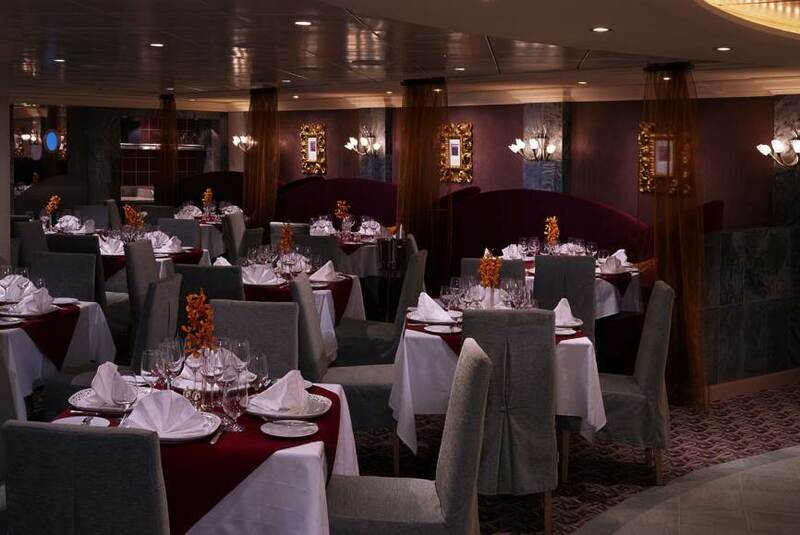 Cunard Grill restaurants are approved by food critics as the best at-sea dining experience. Todd English Restaurant, chic and cozy, is alternative restaurant, 216-seat, with $30 cover dinner charge. 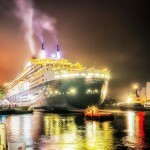 Todd English is the first at-sea venture of the American television chef and features his famous Mediterranean cuisine. 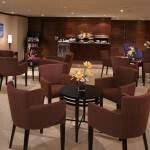 Kings Court is ideal for casual lunch or breakfast as it is an informal, 478-seat eatery. At night it transforms into four intimate venues: the Carvery, Italian trattoria, Asian restaurant, and Chef’s Galley, featuring live demonstrations of meal preparation. Golden Lion Pub offers fine ales, lagers, pub snacks, all served in the charming pub where guests enjoy a pint while watching sporting events. Boardwalk Cafe is a casual eatery by the pool, good for lunch. The best of it is you can eat in a swim suit! Fast food lovers can find comfort in the outdoor Boardwalk when weather permitting. 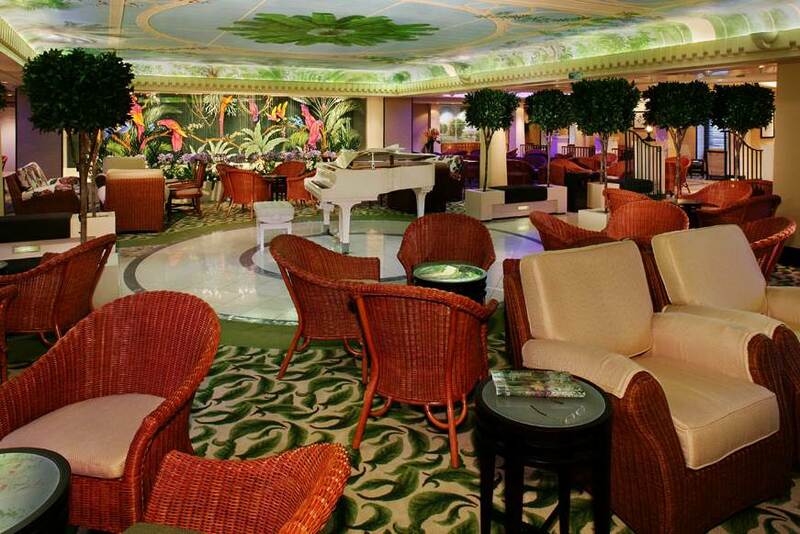 QM2 Winter Garden and Queens Grill Lounge are the perfect spots for your British afternoon tea. It’s served brewed freshly, with no tea bags, complete with clotted cream, scones, finger sandwiches, fresh pastries and white glove service. 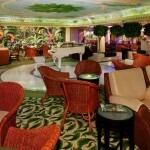 There are 14 bars, lounges and clubs onboard QM2. 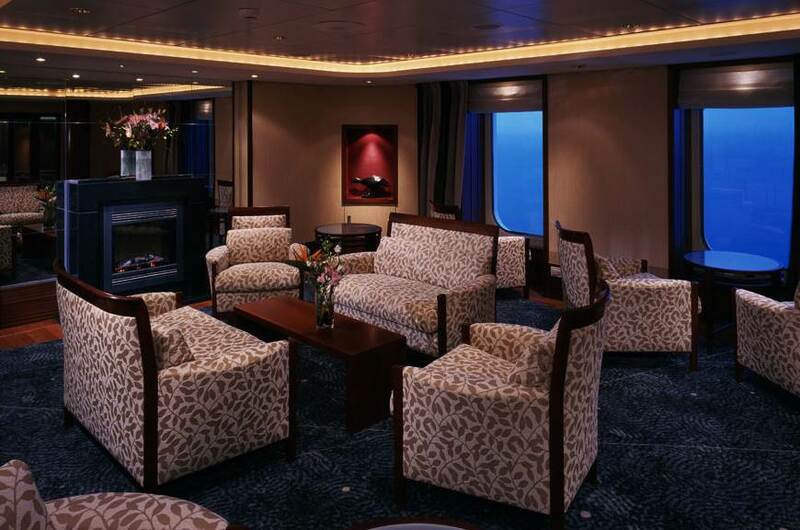 The delightful observation lounge Commodore Club, has commanding views over the bows and light jazz is played each evening. 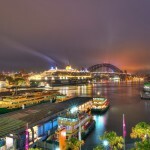 Other fine drinking places include Sir Samuel’s wine bar, the nautically-themed bar The Chart Room, Champagne Bar and Coffee Bar. 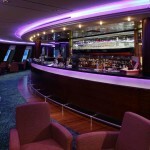 Outdoor bars include Terrace Bar and Regatta Bar. 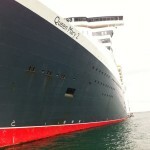 Queen Mary 2 was designed for comfy cruising even when in rough seas. 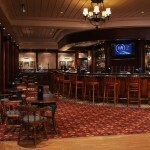 Most of QM2 public areas are situated on Deck 2 and Deck 3, including the Chart Room, Empire Casino, and Gold Lion Pub. 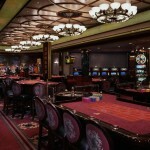 Dancers should head to Queens Room ballroom, which has crystal chandeliers and high arched ceiling. 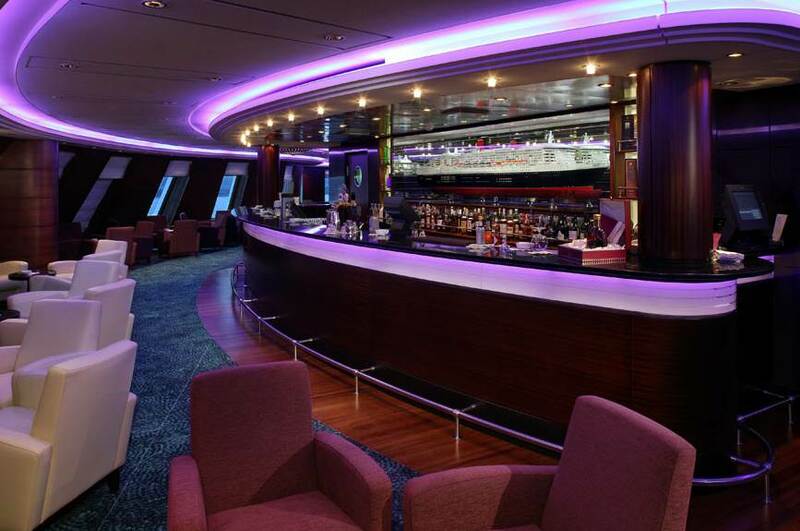 Up on Deck 9 is one of the best spots for good views and a drink in the Commodore Club. 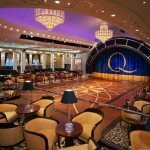 QM2 carries small musical units, high-class bands, duos and solo entertainers performing live music in bars and lounges. Under Oxford University partnership, ship’s enrichment programmes supply specialist lecturers. 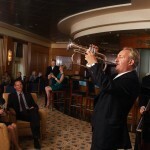 New York Juilliard School of Music is also QM2 partner and selected jazz musicians sail on transatlantic crossings. 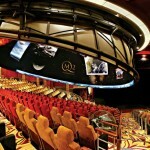 QM2 Planetarium – Illuminations, is the first at sea full-scale planetarium. It has 150 reclining seats, and guest can take virtual rides into outer space and view the stars or other visual spectacles. 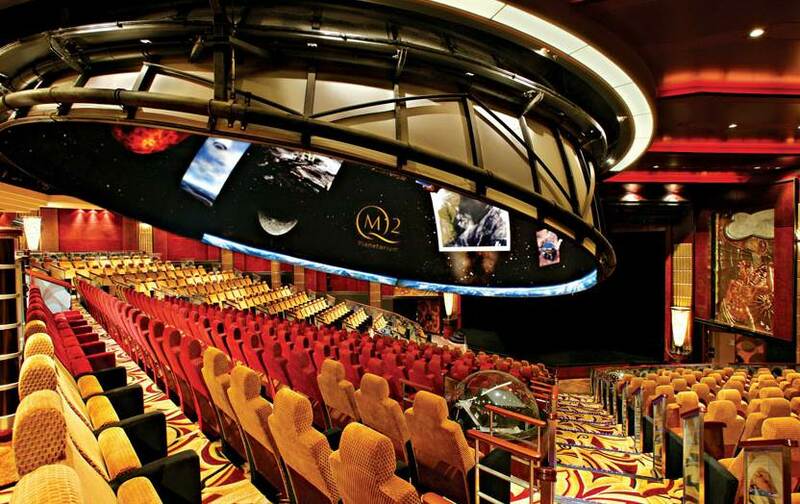 QM2 full-scale planetarium also functions as grand cinema and lecture hall, even as broadcasting studio. 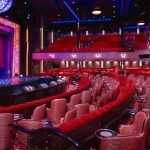 The Royal Court Theatre is 1,094-seat, presenting West End-style productions, cabaret acts and headline entertainers. RADA – Royal Academy of Dramatic Art supplies actors to perform and lead workshops. Cunard ConneXions offer enrichment cultural program, seven classrooms and 500-seat auditorium. 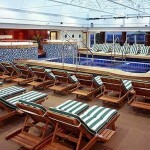 QM2 guests can attend seminars, lectures and workshops. Classes range from foreign languages to fashion, period furniture to watercolor techniques, film making to British comedy discussions. 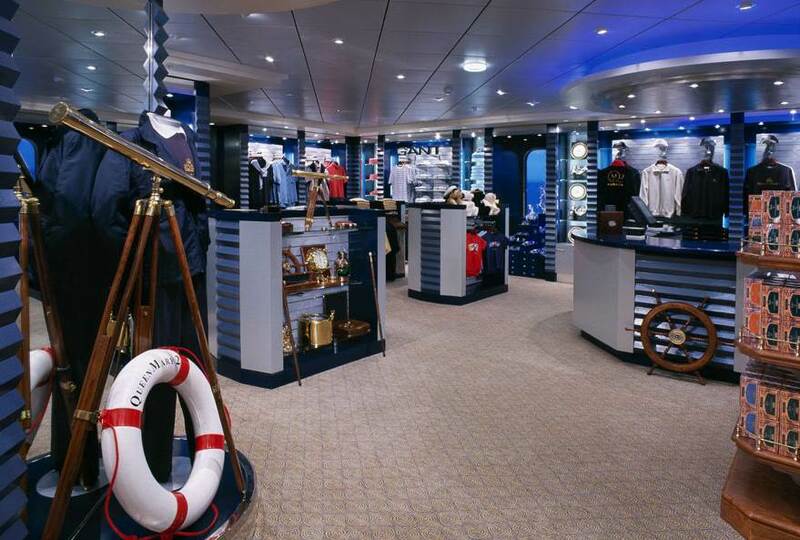 The Maritime Quest exhibit has museum quality – it’s like a tour to the transatlantic cruising’s golden era. Famous international artists were accredited to produce over 300 original art works valued at over $5 million. 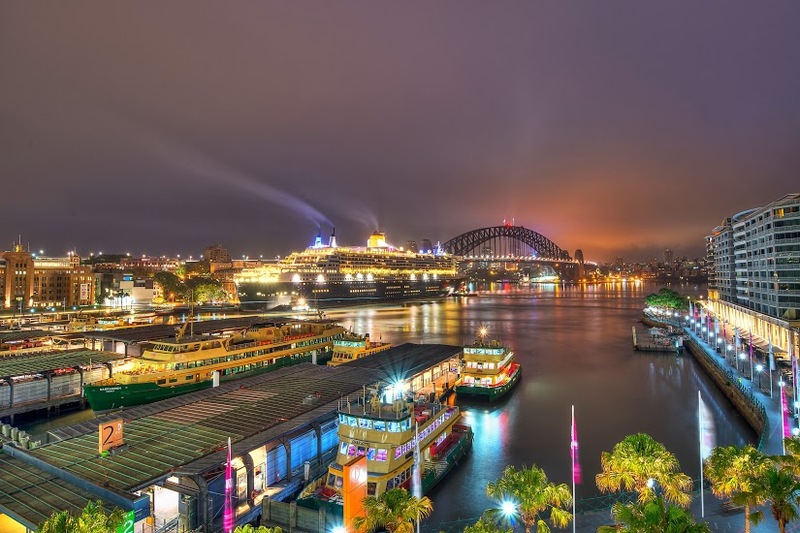 QM2 Interactive TV helps guests receive and send e-mails, review seminars they might have missed, choose from various movies, and sign up for Cunard shore excursions from the comfort of QM2 stateroom. Passengers can also surf the web, check e-mails or transmit video postcards to family and friends. 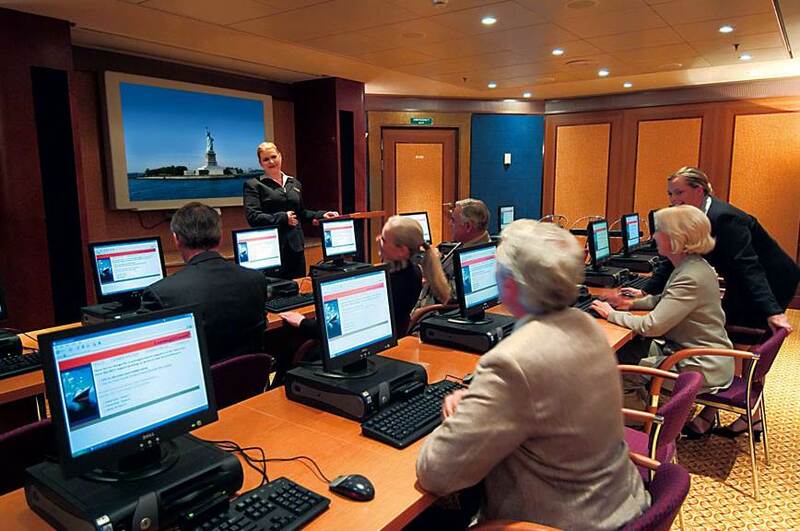 Choose to take classes in QM2 Computer Centre, or take your own laptop – each stateroom features direct Internet access. 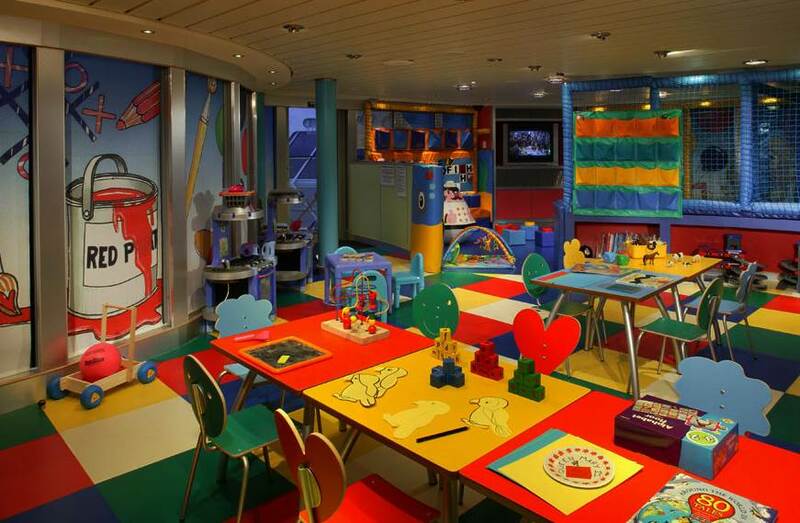 QM2 Play Zone helps guests who wish to take their kids along. 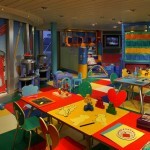 The Play Zone is QM2 best spot for 2-7 years old children. It’s a separate facility, providing hours of supervised activities and entertainment. The area includes Minnows splash pool, an array of activities and toys from computer terminals to board games, and English nannies for toddlers. 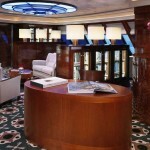 It’s not surprising that QM2 which is one of the most luxurious cruise ships ever built features Canyon Ranch spa. The highly approved health resort company offers life-changing programs which include a variety of workshops on healthy aging, diet and disease prevention, as well as stress-relief classes. 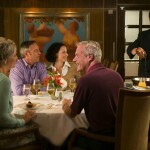 Canyon Ranch guests can savor award-winning resort’s spa cuisine at dinner and lunch in Britannia Restaurant. 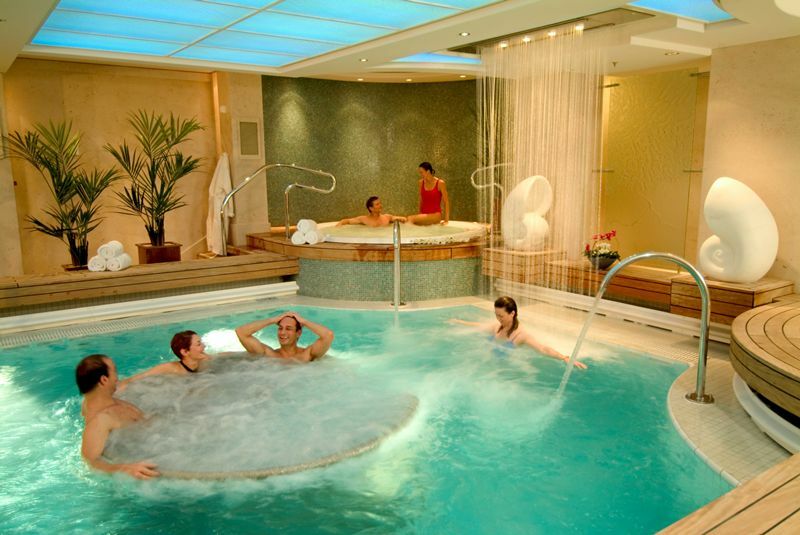 More than fifty Canyon Ranch wellness and health experts work in the 20,000 sq.foot (1,858 m2) facility – the largest at-sea-spa, including 24 treatment rooms, a whirlpool, thalassotherapy pool, thermal suite with Finnish and herbal saunas, aromatic steam room and reflexology basins. Wellbeing treatments include a variety of skin treatments and many massages. 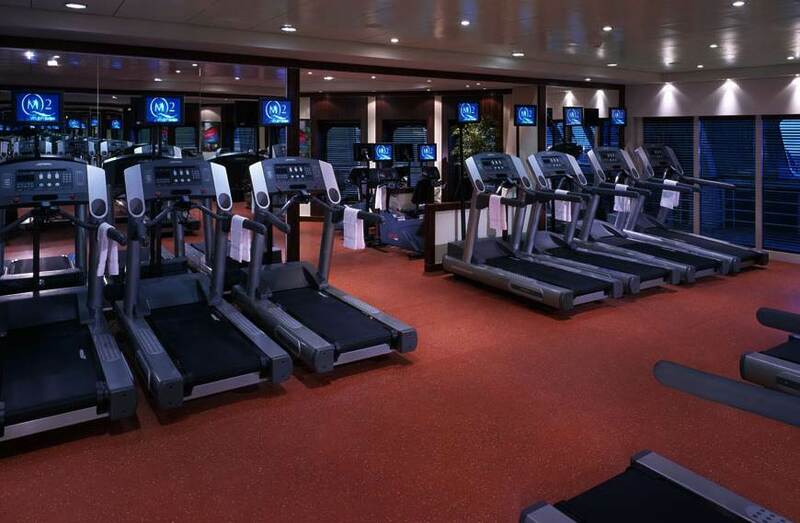 The gymnasium has free weights and the latest equipment. 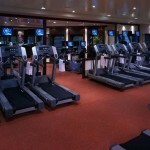 Sports facilities include paddle tennis court, electronic golf simulator, and giant chess board. The beauty salon offers full menu services for skin and hair. 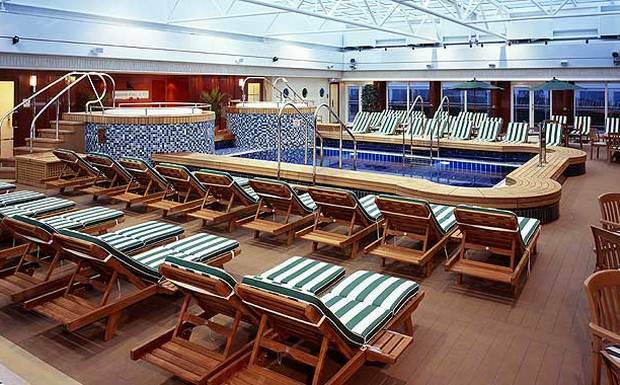 QM2 Spa Club facilities are also available through the purchase of daily Passport, covering Aqua Therapy Centre, Fitness Centre, locker rooms, relaxation lounge, and daily fitness classes on your choice (from yoga to Pilates, aerobics, indoor cycling). 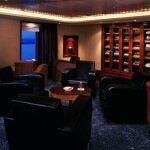 Robes, slippers, complimentary beverages in relaxation lounge are provided. Passports are valid between 8 am-8 pm. 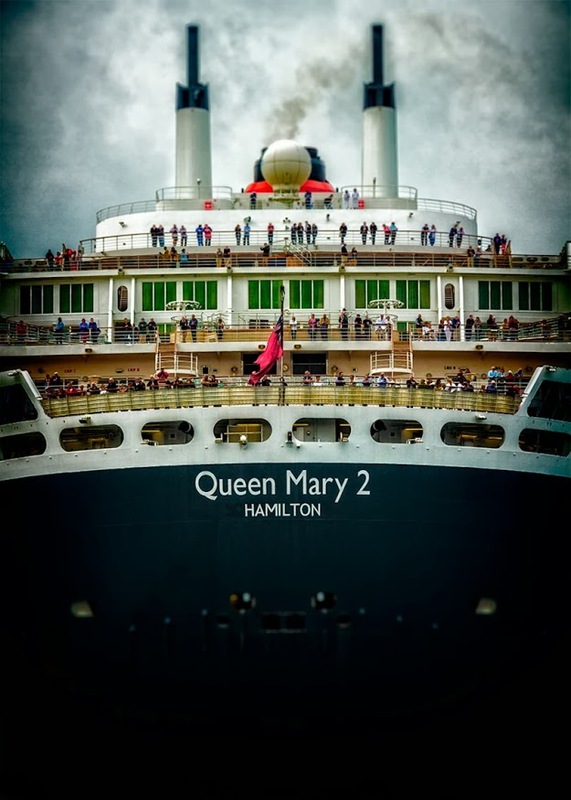 As you might expect, being a transatlantic liner, QM2 attracts primarily North American and British passengers, especially on her crossings. 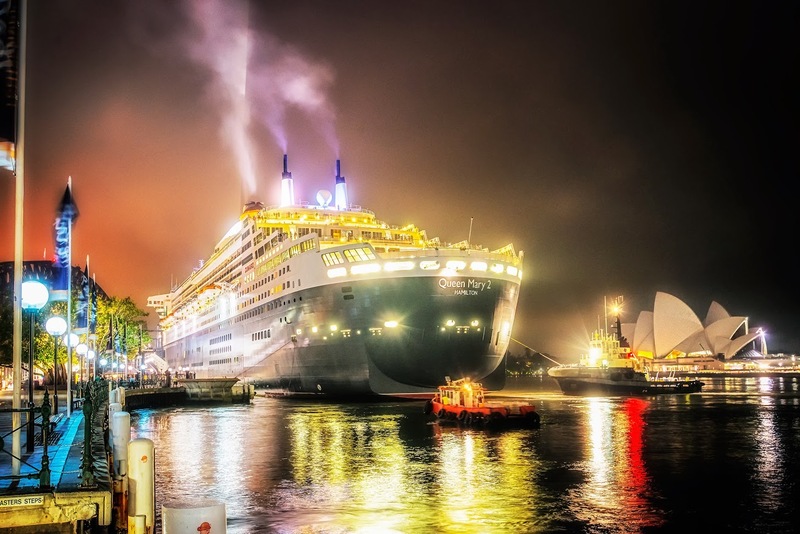 Queen Mary 2 regular voyages to Hamburg ensure steady streams of German guests, as well. 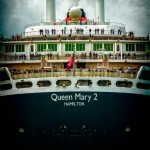 That being said, QM2 iconic status means you’ll find any nationality onboard. Passenger breakdown for New York-Canada roundtrip encompassed 26 nationalities. 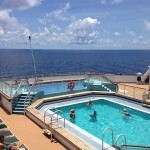 QM2 guests are mainly on the older side, as their average age is around 70. 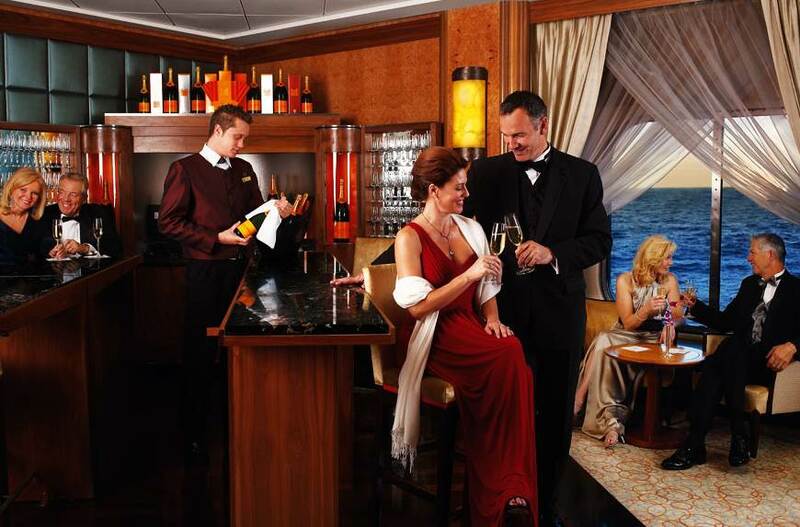 Lots of them choose Cunard for the stricter dress code and adherence to tradition that you will not see followed on other lines. During school summer holidays you’ll find more kids onboard on itineraries which are not transatlantic (Caribbean, Norway and Eastern Seaboard). 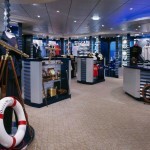 Cunard dress code is possibly the most formal and most QM2 guests are happy to oblige. They tend toward casual country club during the day, although European or transatlantic voyage is dressier than one in the Caribbean. A crossing features typically three formal nights – of these some with theme (Masquerade or Black and White), and three informal nights. 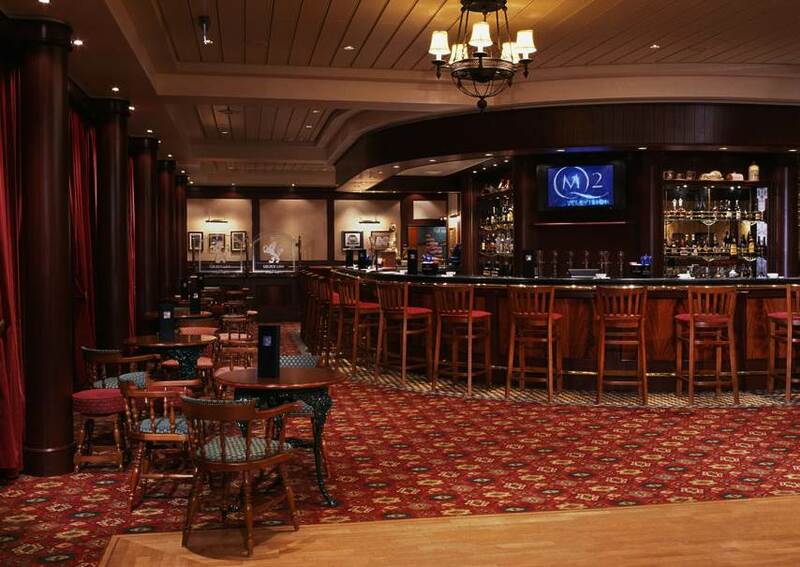 QM2 official dress code changes at 6p.m., and jeans are discouraged throughout ship, other than at Winter Garden bar and Kings Court buffet. QM2 informal nights can feel as deluxe as formal nights on other cruise ships, with women in cocktail dresses and men in sport coats. 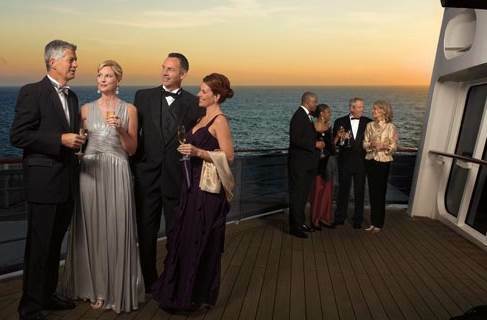 During formal nights the majority of women wear long gowns; men are in tuxedos or dark suits. 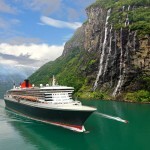 Queen Mary 2 cruise ship provides personal butler and concierge services. 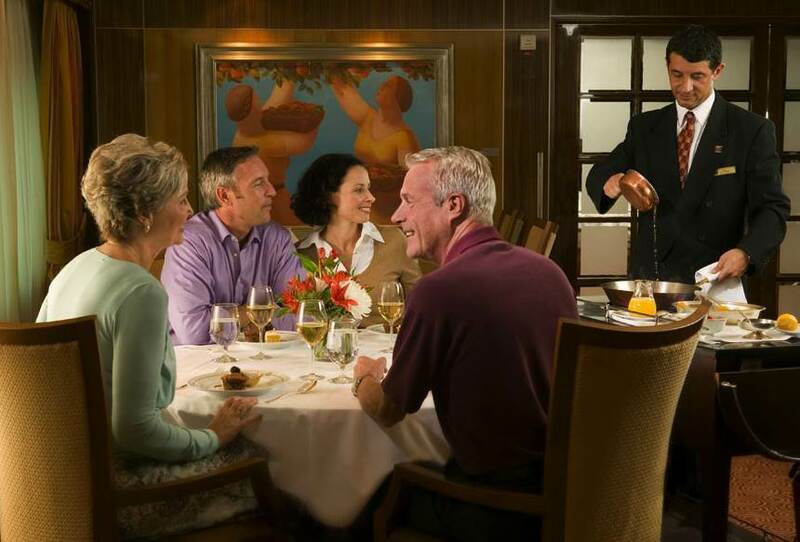 Concierges serve guests in all Grill Accommodations. 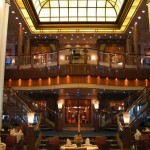 Queens Grill categories feature also private butler service. 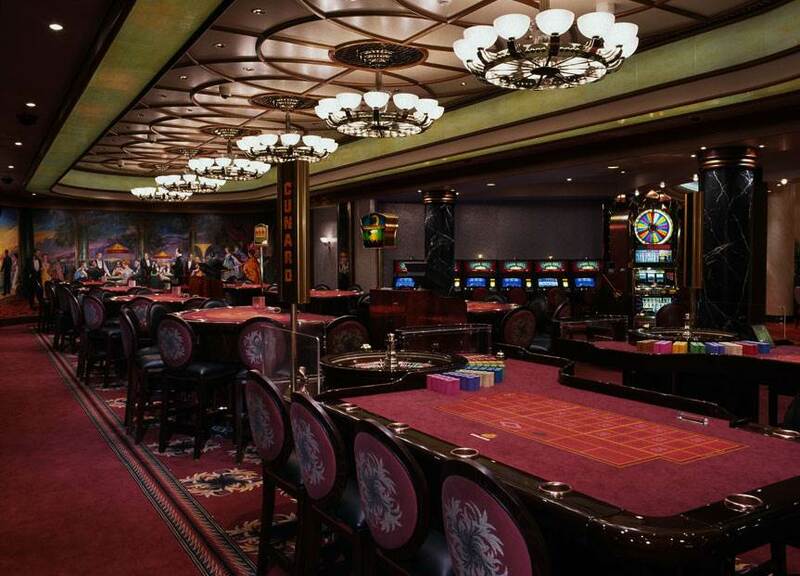 Despite the fact that QM2 features British flair, the U.S. dollar is her onboard currency. Cunard charges $11 per day, per person (for regular passengers), to shipboard accounts; $13 per day is the charge for the ones in the Grills. 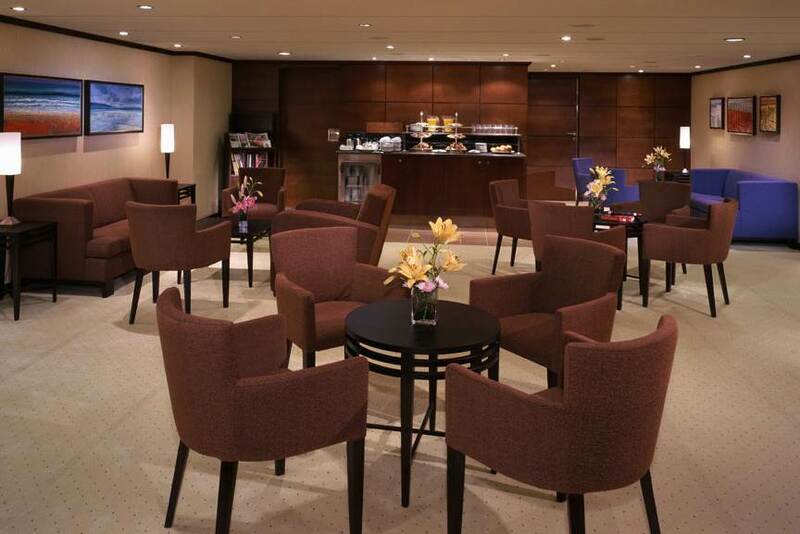 15% tip is added automatically to guests’ bills for purchases in QM2 lounges and bars (there’s also space for “extra” gratuity). 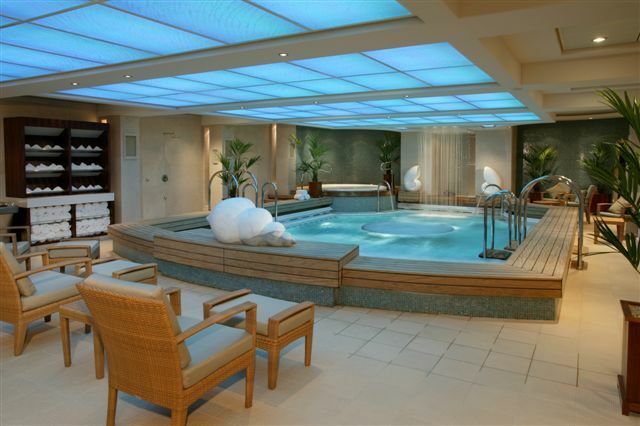 Canyon Ranch Spa Club treatments include 12.5% tips, but you can always add more. 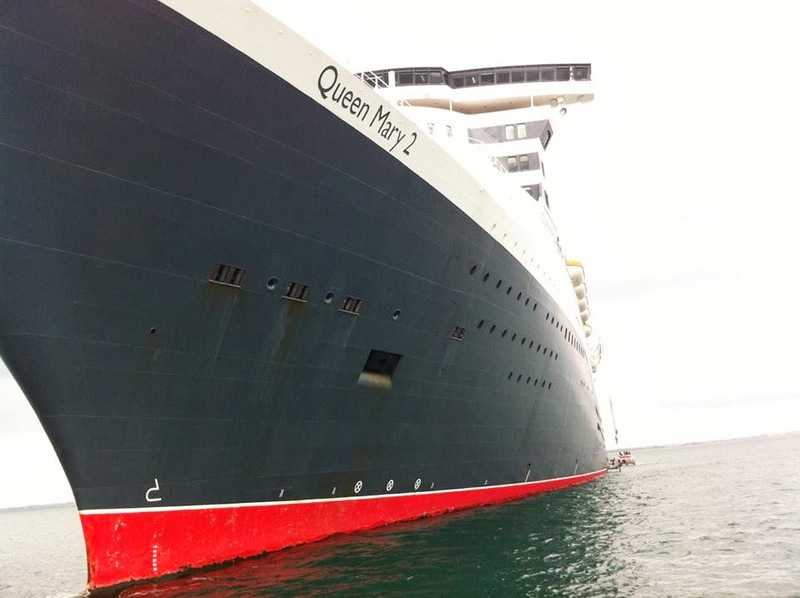 As in 2015 the Cunard Line celebrated its 175th anniversary, the company also announced that the QM2 ship will undergo a 25 days dry-dock refurbishment. All the works will be done by the Blohm+Voss in Hamburg, Germany. 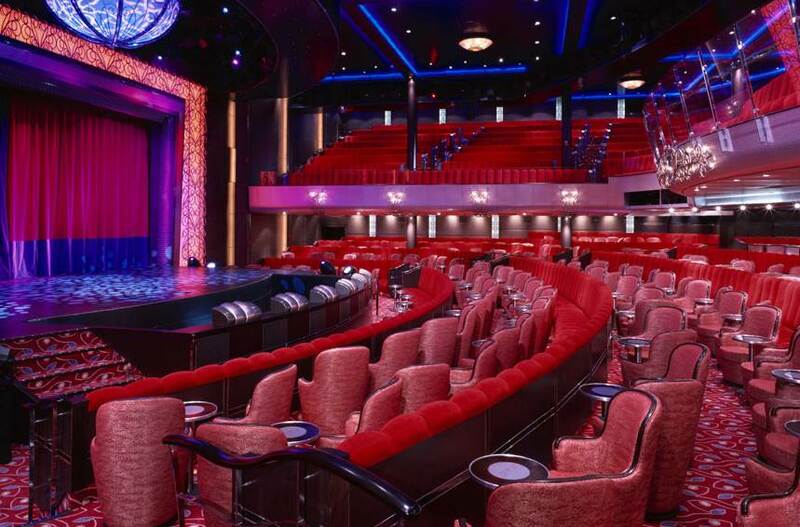 The QM2 refurbishment is scheduled for 2016 (May 27 through June 21). 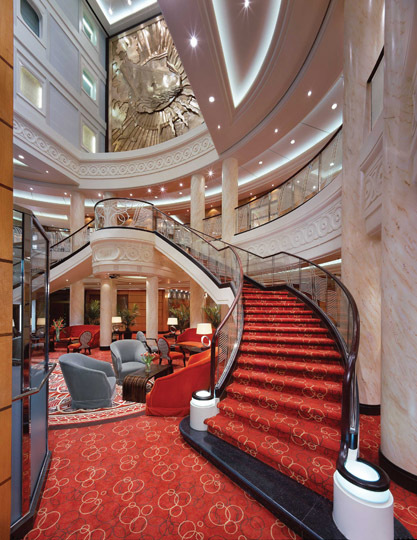 More details on the QM2 refurbishment upgrades will be announced in the coming months. 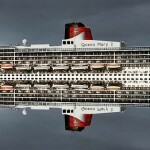 It’s a simple fact – RMS Queen Mary 2 is the most famous cruise liner, and among the most famous ocean liners ever. Well, probably right after the notorious RMS Titanic. But the QM2 ship is also currently the most British, and one of the not so many “affordably expensive” luxury cruise ships in the world. In our days, the words “Cunard QM2” are associated with stylish luxury at sea, standard, perfection, service, UK – and very rich people. 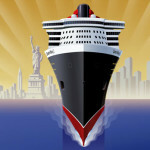 The very combination “Cunard Queen Mary 2” inspires dreaming – of world-class travel by cruise ship that is synonymous with “the world’s only one”, “life time memories”, “unique experience” – and, of course, “Carnival and Micky Arison” – the largest cruise company and the man who made the QM2 dream come true. 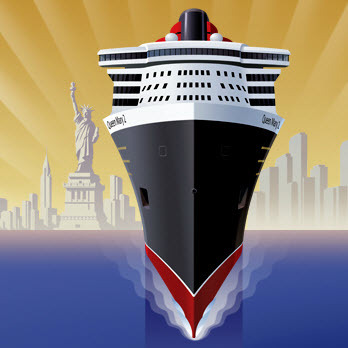 The QM2 cruise ship is and will remain in our civilization’s history as “THE ocean liner of the world”, along with Cunard – the company that gave a new meaning to words like “Transatlantic”, “luxury” and “travel”. 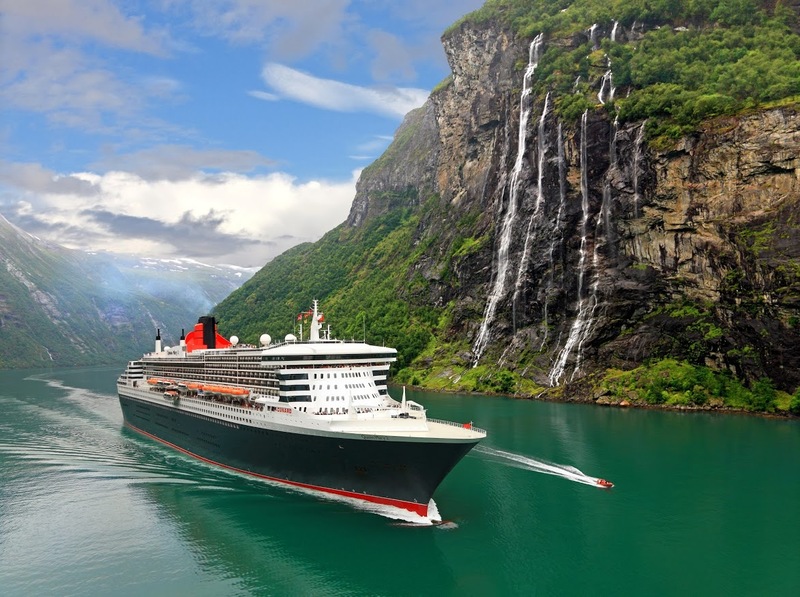 Enjoy the gourmet taste of your money, feast your eyes with the wonders of our world, and always safe and happy vacations on the amazing Queen Mary 2 liner!